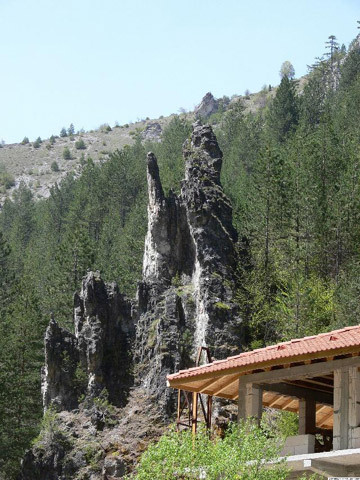 The Yagodina cave is located near the village of Yagodina in the Rhodopes. It is one of the longest (10 km) and most beautiful caves. The natural entrance of the cave is 30 m above the road; that is why an artificial entrance is available for the tourists. The Yagodina cave has 5 floors, part of them are electrified and adapted for tourist visits. In the halls of the cave there are marvellous hanging rock formations – stalactites, ones that have grown from the earth – stalagmites, and ones with colossal sizes – stalactons. Visitors can’t take their eyes off the “drapery”, which cannot be created even by human fantasy. Traces of life from the Aeneolithic period (4 thousand years BC) have been fond in the cave. The Aeneolithic dwellings, found at a ten-minute distance from the artificial entrance of the cave, are open to visitors.